The State Employees Credit Union (SECU) Youth Crisis Center, a Monarch program in Mecklenburg County, is the first step in life-changing treatment for young people between the ages of 6-17 who are in a mental health or substance use crisis. All children and their families should have access to timely, age-appropriate mental health care both during a crisis and beyond. We offer short-term stabilization for an acute psychiatric episode in a secure setting that provides a safe and healthy environment where healing can begin. Children and adolescents receive age-appropriate treatment in individual and group settings, medication as needed, and access to a variety of individual and family services that will help manage their illness and help them better navigate their world. Under the direction of a psychiatrist and other licensed medical and professional staff, this program provides short-term therapeutic interventions designed to prevent hospitalization by reducing and stabilizing a child’s crisis and linking a child to needed care. Upon completing intake paperwork a nurse will begin the in-person screening with the youth and guardian. If the youth meets criteria, a recommendation for admission will be made by the psychiatrist and a staff member will meet with the youth and guardian to begin admission. (Therapist may not meet during initial visit but within 24 hours). Upon reviewing current medications with the youth and guardian, the center will order and provide medications over the course of the youth’s stay at the center. Guidelines will be given on permitted items of clothing and other personal belongings. Your treatment team may include a psychiatrist, psychologist, nurse, therapist, and behavioral health technicians. In addition to the comprehensive clinical assessment provided by the therapist, a psychiatric evaluation will also be completed by a board-certified child and adolescent psychiatrist within 24 hours of admission. In some cases, additional psychological assessment may be administered by the psychologist if needed. Average length of stay at the youth crisis center is approximately 5-7 days and is determined based on clinical need. Treatment includes regularly scheduled group therapy sessions that utilize evidence-based practices such as cognitive behavioral therapy and family check-up. Time is also allotted for completing schoolwork and participating in recreational activities such as practicing yoga, playing games, playing basketball or drawing with sidewalk chalk outdoors, or watching movies with themes and content that fit the therapeutic model of the program. Once the youth is deemed clinically stable for discharge Monarch’s staff will work to develop an appropriate discharge plan, crisis plan, and make any necessary recommendations and referrals for continued treatment and services. These plans are communicated to the youth, their guardian(s) and natural supports, and other community partners who are involved in the youth’s care as necessary. Visitation of youth is essential to their care; we encourage visitation throughout the day by appointment. Please speak with a member of our staff for current visiting hours and to schedule your visit. As a voluntary admission, notice of this admission will be submitted to the Clerk of Superior in order to set a hearing date. The legally responsible adult(s) will be made aware of the hearing date. This hearing is designed to ensure a minor may not be kept in a facility without due process and will be scheduled within 15 days of this admission date. Within 48 hours of receipt of notice of the admission an attorney shall be appointed to ensure the best interest of the minor throughout this process. Should a minor be discharged prior to the hearing date, Monarch will notify the Clerk who will stop the process. If the minor remains in the facility on the hearing date he/she will be allowed to attend and provide testimony related to their continued stay. Following the hearing the Judge may concur with the admission and then set a length of stay. If the Judge believes there are “reasonable grounds to believe” the admission criteria exists but may need more evaluation or the Judge can order discharge from the facility which would happen immediately following return to the facility. Should a legal guardian request discharge in writing, the minor may continue to be supported in the facility for up to 72 hours in order to review if involuntary criteria is met. The youth crisis center is also able to begin the process to petition a youth for involuntary commitment (IVC), and to admit youth who have already been involuntarily committed. Click here to download a PDF of the eligibility criteria. The SECU Youth Crisis Center serves children and adolescents from across North Carolina. Anyone may refer a youth in crisis to the SECU Youth Crisis Center, including other mental health providers, primary care providers, school personnel, parents, other family members and friends. When possible, please call ahead to speak with our nurse to ensure bed availability. Walk-ins are also welcome. Referrals may be made to the SECU Youth Crisis Center 24/7, 365 days a year. What sets Monarch's Youth Crisis Center apart? 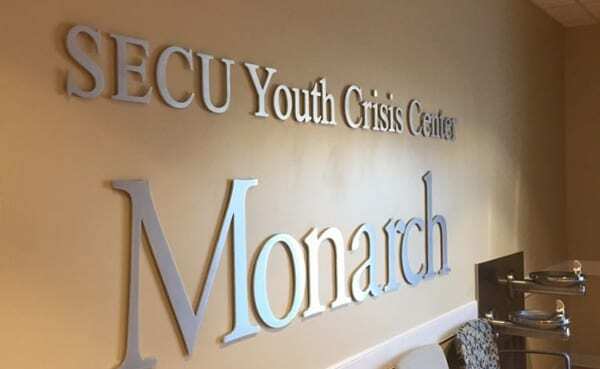 The SECU Youth Crisis Center, a Monarch program, is the first of its kind in North Carolina and serves as an alternative to the emergency department and to hospitalization for youth experiencing a behavioral health crisis and in need of specialized psychiatric treatment. The center utilizes a trauma-informed approach to care and does not force medications or utilize chemical or physical restraints but employs other therapeutic forms of de-escalation. The center was designed with the utmost priority of ensuring the safety of the youth served while also providing a warm and welcoming environment. State-of-the-art equipment such as specialized anti-ligature fixtures, security cameras and a PinPoint alarm system help to keep both people supported and staff at the center safe. What personal items are youth permitted to bring to the SECU Youth Crisis Center? Two changes of clothing are recommended. A washer and dryer are available in the unit. Staff will assist with laundering clothing as needed. Loaning or exchanging clothing at any time is prohibited. *We will not assume responsibility for any lost or damaged items. What food and beverages are provided for youth in the center? Breakfast, lunch and dinner are provided seven days a week at regular times. All food and drink will be consumed in the multipurpose room. Snacks are also available at designated times. Outside food and drink, along with caffeinated beverages, are not permitted at any time. May I visit my child while he/she is at the Youth Crisis Center? Immediate family members and designated guardians are encouraged to visit daily. Visitors are permitted in the multipurpose room only; safety and social courtesy will be made a priority. Visitors are not allowed to bring personal items into the facility. During intake, the legal guardian will provide a list of four individuals considered immediate family members that may visit. Upon arrival to visit, photo identification will be required. Only two visitors are permitted at a time, and no visitors under the age of 18 will be permitted. Staff are unavailable to watch minors brought to the center during visitation. How is the State Employee’s Credit Union affiliated with the SECU Youth Crisis Center? How do I make a referral to the SECU Youth Crisis Center? Referrals may be made to the SECU Youth Crisis Center 24/7, 365 days a year. Walk-ins are always welcome, or you may call ahead to speak with a nurse regarding availability (this is preferred). What information will I be asked for when calling to make a referral? How can I obtain information regarding the youth’s treatment at the center? Please feel free to call the center directly anytime and speak with a member of our staff. Our psychiatrist will also be in touch regarding the youth’s treatment and status. What information will be shared with the agency/provider assuming follow-up care after a youth is discharged from the center? The youth’s discharge plan and crisis plan will be explained in detail to his/her guardian prior to discharge, and a copy of each is provided. Staff encourage the guardian to share this information with others who may be involved in his/her care, and staff will assist in making additional copies for the guardian if desired. A release of information must be signed by the youth’s guardian to be able to share information directly with any other agency or provider. With the appropriate release in place, the agency or provider may contact the youth crisis center to request information about the youth’s care and treatment as needed. Sometimes Monarch’s medical records department must be involved in sharing copies of documents and other information.